As its name suggests, the architectural firm Spridd – meaning ‘scattered’ in Swedish – was created to seek out diverse and sometimes unusual perspectives on architecture. Through fresh thinking and collaborations, Spridd aims to find innovative solutions to today’s myriad of social challenges. One such major challenge is how to build sustainably. The demand for housing is increasing with the global population, yet the construction industry is one of the largest sources of carbon emissions. How to build affordable, high-quality homes with minimal environmental impact is one question with which Spridd has worked extensively. 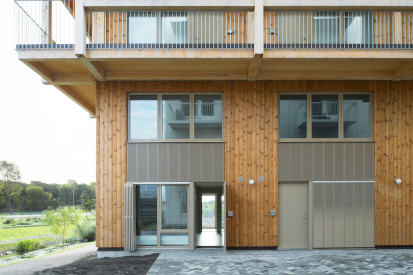 One approach is to look at new materials and building techniques, and last year, Spridd unveiled their Wooden Box House at the Vallastaden 2017 housing expo in Linköping. Six stories high, with generous balconies stretching all the way around, the residential building is built almost entirely of wood and is one of the most visually striking among the expo’s many innovations. Wood is generally accepted as one of the most sustainable building materials, yet it also poses plenty of challenges. “And that’s also why we wanted to do that project,” says Broms Wessel, “to test out new technical solutions and show the architectural potential in large-scale wooden structures”. 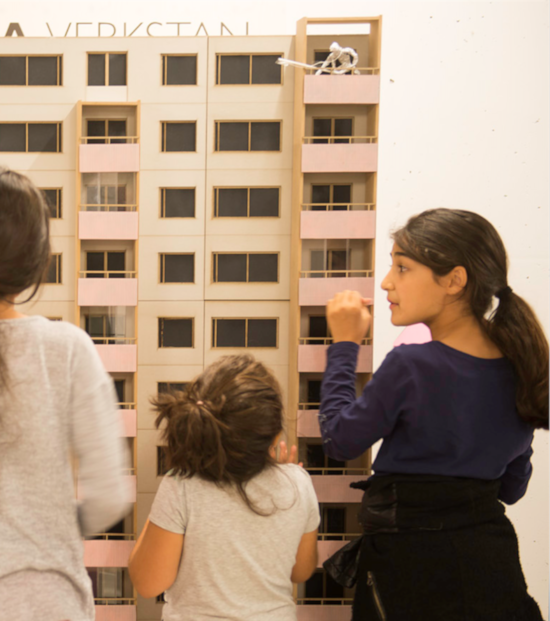 Collaboration with residents was a cornerstone of Spridd’s work in Fittja, Stockholm. Working with The Million Programme project, which is focused on the sustainable and affordable renovation of the extensive housing stock built in Sweden in the 1960s and 1970s, Spridd carried out a pilot renovation project, titled ‘The Fittja People’s Palace’, in 2013. Residents took an active consultative role throughout the renovation project, with the aim of meeting the tight budget set up to keep the rent increase to below 20 per cent. This was fundamental, given the pressing need for quality housing for people on low incomes. The project was the winning Swedish proposal in the Nordic Built Challenge 2013, which praised the concept as ‘a radical departure’, in ‘daring to suggest small but strategic changes’. Despite their low-key approach in Fittja, however, Spridd are far from low-profile, and a number of projects – many the result of winning competitions — have gained significant attention. Spridd’s proposal for a Multicultural Centre in Rinkeby, Stockholm is one example. The centre would be a major new construction, to meet the social and cultural needs of the local community. Flexibility is incorporated into the design, allowing it to be used not only as a mosque, but also as a restaurant, fitness centre, library and shops. ‘Meeting’ and ‘flexibility’ are also central themes in Spridd’s re-working of St. Paul’s Methodist Church in Stockholm, the result of a competition win, which will see the former church room opened up into an inclusive and multi-functional space for the City Mission’s community activities, with the creation of an interior ‘square’, to mirror the exterior square by the building’s entrance. Spridd also achieved international plaudits for its ‘Weave’ design, which took the prestigious award for residential housing in the 2013 AR/MIPIM Future Project Awards. Designed for the former industrial town of Norrköping, the building references the architecture of the surrounding historical textile factories, such as the large and repetitively organised windows, while the façade, made of undulating concrete, is reminiscent of fabric. Yet while peer acclaim is welcome, Broms Wessel and his colleagues are not afraid to ruffle feathers. 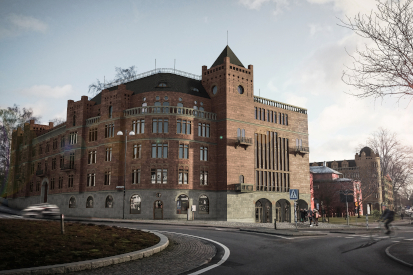 Sigfridshäll will be a new building for the town of Växjö, which Broms Wessel admits is “incredibly controversial”. The project challenges an idea, almost taken for granted, that contemporary architecture should be minimalist and cost-effective, driven, above all, by profit margins. Instead, Sigfridshäll is an almost playful tribute to the ornate grandeur of 19th-century architecture, with a tower, balustrades and small decorative details to offer an alternative to the dominant aesthetic of today.